During Tokyo Game Show 2018, developers from Bend Studio showed off a new demo of Days Gone. It’s a lengthy look at its gameplay, running 15 minutes long, and features the protagonist, Deacon, using stealth tactics to his advantage. Creative Director John Garvin provided commentary over the action, while Game Director Jeff Ross took control of the sticks. The Days Gone demo, which is essentially split into three parts, started with “You Got a Death Wish,” a mission Garvin described as “wide-linear.” The crux of it is that Deacon needed to find his way into a nearby gas station for motorcycle parts. When slinking around on the ground was no good, Ross had Deacon climb atop a tractor trailer. From the new vantage point, Deacon equipped binoculars to get a tactical view of his surroundings. This prompted him to sneak into a building. During this part of the demo, Garvin explained that “all interiors can be searched,” which is especially beneficial when scavenging for supplies. While maneuvering through the area, Ross spotted a nest in a building. This is where freakers “hibernate” during daytime hours, explained Garvin. These nests are denoted by clusters of branches sprouting out. Apparently, throwing a molotov cocktail inside eliminated the threat. However, setting fire to the nest attracted more freakers. Eventually Deacon was overwhelmed by enemies and died. The second part of the demo is where Ross tried employing a stealthier approach. In one instance, throwing a rock at a car proved particularly useful, as it set off the car’s alarm and attracted enemies. When Deacon finally reached the gas station, the demo cut to a different section of the game. There, Days Gone’s impressive tech was fully on display—300 freakers were shown on-screen all at once. For the most part, Deacon took them on by putting fire to good use. 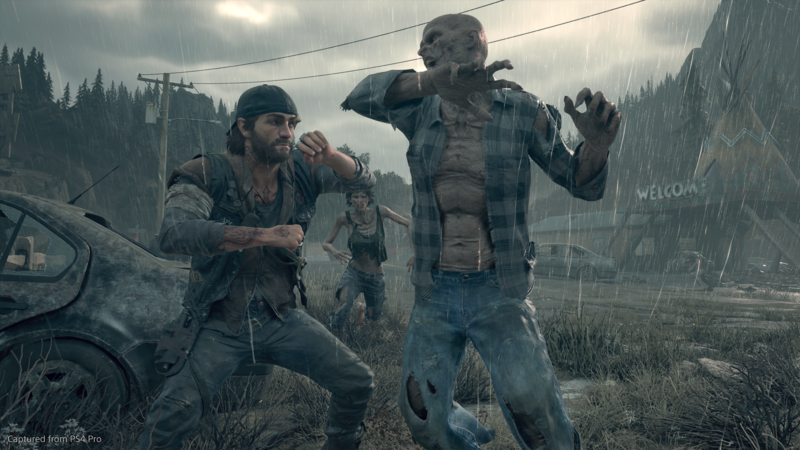 There’s still a lot we haven’t seen of Days Gone’s dynamic open world. Information continues to trickle out piecemeal, but it at least seems as though this won’t be an average, everyday zombie game. Days Gone hits the PlayStation 4 on February 22, 2018.